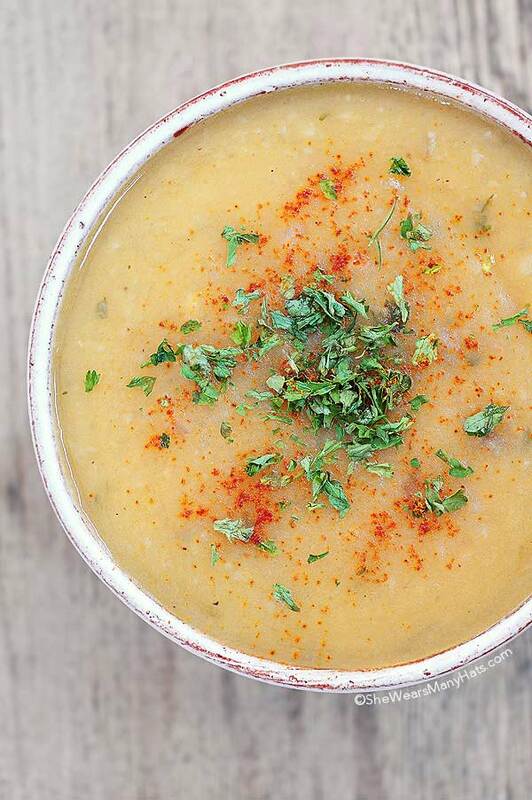 This Perfect Potato Soup Recipe is a lightened up version, but you won’t miss a thing. It’s so full of flavor and the best comfort food around. I’ve shared about my passion for potatoes before, being that I’m all Irish and everything (a wee bit at least). So, of course, Potato Soup has got to be my all-time favorite when it comes to soup. Definitely. This is a classic recipe for Potato Soup. It’s easy too, and since no cream is required, this recipe is more on the lighter side, which is always a good thing. Along with a salad and some crusty bread for dipping, a bowl of this Potato Soup is the perfect meal for an Irish girl like me. This soup can easily be made ahead. Just reheat slowly, whisking occasionally. Unexpected extra mouths to feed? Easily extend the serving amount by adding a bit more broth with a little water. Whisk to incorporate. When possible, use chicken stock instead of chicken broth. It lends a richer flavor. There are good store bought options to be found. This soup can be served warm, or if you’re into chilled soup, chilled. 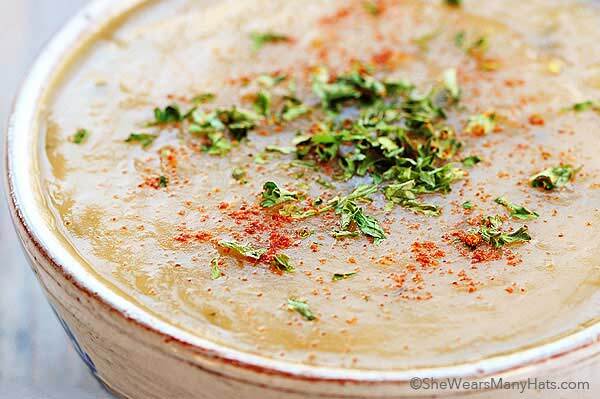 This Potato Soup recipe serves well as a starting place for other thicker-based soups. Add chicken, asparagus, broccoli, cheese, browned ground beef, or roasted mushrooms, just to name a few. Get creative and make it your own! Also, if you’re a big potato fan like me, or Irish through and through, I think you’ll like this recipe for Quick Baked Potatoes. They are incredibly easy and pretty doggone tasty too. An easy recipe for the perfect bowl of comfort. Heat olive oil in large stockpot over medium heat. Add diced onions and sauté for 5 minutes. Add stock and diced potatoes and bring to a boil. Boil for 2 minutes, then reduce heat to a simmer, stir in salt, ground red pepper, ground nutmeg, and dried parsley. Simmer until potatoes are tender, about 10-15 minutes. Reduce heat to low. Using a potato masher, mash potatoes directly in pot, or using a slotted spoon, remove potatoes to a bowl to mash, or process through a food mill or ricer. Mash to desired texture. If you prefer larger pieces of potato only mash a portion of the potatoes. If removed, return mashed potatoes to broth. In a small saucepan or skillet brown butter over low heat. Stir in flour, then add 2 cups of broth and stir to blend well. Continue to stir until mixture thickens. Once thickened, stir into soup, combine well. Bring soup back to a low simmer for 3 minutes. Salt and pepper to taste. If desired, garnish with additional ground red pepper, ground nutmeg, chopped chives, dill, and/or shredded cheese. I love potatoes soup too. 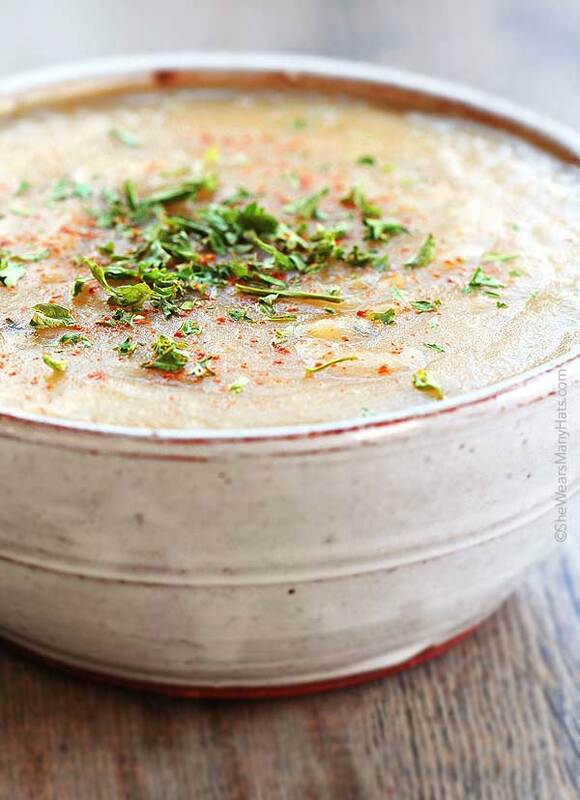 I’ve been making potato chowder a lot for the last few months because this is one of the very few things I know how to cook…..
My daughter and I absolutely love potato soup. Ours is milk based, so I’m anxious to give this one a try. If I could only have one soup for the rest of my life, it would have to be potato soup. Delicious perfection in a bowl! This sure does look perfect! I adore potato soup! Potato soup is my favorite! These picture are truly amazing! Can’t wait to dig into this recipe! I love soup for a crowd! And potato soup is always comforting. WINNER! Do potatoes have a season? I feel like the dead of winter is potato season, which means it is high time I made this. How about using other types of potatoes other than red? I have a mish-mash of potatoes from my farm box and I’m wondering how they’ll do. I think any kind would be just great! Happy cooking! Potato soup is one of my faves, and I love your add-in options! Great ideas! Gorgeous and it looks so creamy and perfect! I would love a hot bowl right now!! Great recipe, Amy! 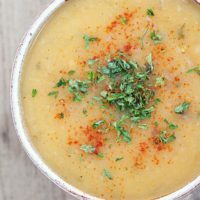 This weather is putting me in the soup mood and I need to try your Prefect Potato Soup it looks amazing! Yummy! I want to dive in about now! Perfect Potato Soup indeed! This soup looks like just what I need after all this cold! Have you tried adding bit of turkey bacon? If not is that something you’d recommend? I think either of those additions would be fantastic! It’s a great base for adding so many options. Enjoy! I’ve made this soup twice now and both times it was delicious! So glad to have found a thick, creamy potato soup that isn’t diary based. Thanks for the new winter staple! Yay! It’s a keeper for sure. 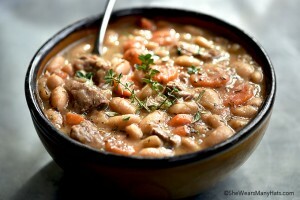 It’s freezing here, so thinking this weekend may be a good time to make a pot of this. This was a delicious soup. I used red potatoes from my farm box that had pink flesh. It made an oddly colored delicious soup. Super easyt too, my favorite kind of recipe. Oooh fun! I bet that was pretty. Has anyone tried to adapt this to a crockpot recipe? I would love ideas! I made this delicious soup as written. It reminded me of the potato soup I so enjoyed in Ireland. The soup is tasty and the BEST recipe for Irish potato soup…hands down!! Yay! I’m so glad to hear that you enjoyed it. Potato soup is certainly a favorite of mine. The best potato soup I’ve ever had!!!!! I’m gonna use this recipe forever! Definitely like a 5 star rating!!!! The best potato soup I’ve ever had!!!!!!!!!! I’m gonna use this recipe forever!!!!!!!! Definitely a 5 star rating!!!!! Love it!!!!! !